Blyth Spartans defender Nathan Buddle believes Birmingham City’s class showed in the end after the Championship side fought back from two goals down to dump the spirited non-leaguers out of the FA Cup Third Round today. Blyth, of the Northern Premier League, grabbed a dream 2-0 lead thanks to a first-half brace from captain Robert Dale. But Birmingham turned the tie on its head by scoring three goals in six second-half minutes. 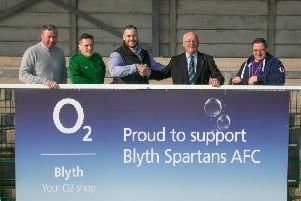 Buddle, from Amble and who played at the heart of Blyth’s defence this afternoon, admitted it was disappointing to lose, but he was proud that Spartans pushed their higher-league opponents so close. The 21-year-old said: “We never really expected to be leading 2-0 and when we came out in the second half we knew that we had to keep things tight and not concede early on. “There were perhaps some nerves from us at the start of the second half – especially after they scored their first – but Birmingham’s class showed and they scored the three goals. The match was played in front of a sell-out crowd at Croft Park and Buddle described the atmosphere as amazing. Blyth’s cup run included higher-league scalps against Altrincham and Buddle’s former club, Hartlepool United.